I f anyone can calm fears of a robot apocalypse, it’s Kevin Kelly. Over the years — first as the founding executive editor of Wired, then as the author of books like What Technology Wants and Out of Control: The New Biology of Machines, Social Systems and the Economic World — he has become one of the 21st century’s most prescient theorists not only on the future of technology but also on our constantly evolving relationship with it. 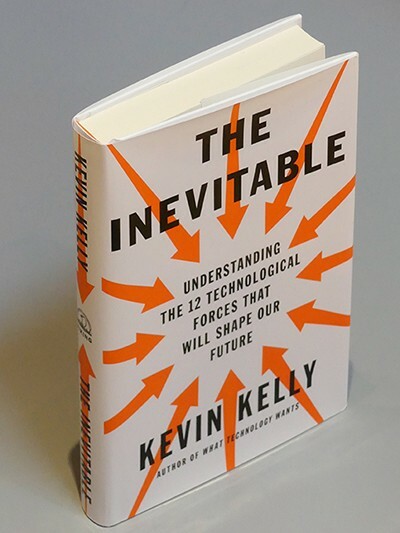 In his latest book, The Inevitable: Understanding the 12 Technological Forces that Will Shape Our Future, Kelly writes about the unstoppable trends that we often fear when it comes to technological progress. In a recent interview with Slack, he laid out his vision of the future of work and some simple reasons why we may want to reconsider some of our deep-rooted anxieties about it. Why do you think there’s such a huge amount of fear around automation and AI? Our intelligence is so central to our identity, that when someone suggests that we can synthesize it, and install into other things, it immediately empties us of our identity and we say, “What are we going to do?” If there’s a suggestion in any way that it’s better, that other things are better, then it’s like, “That’s game over for us.” There’s a direct 1–2 step. Nobody has had any trouble making that step to, I’m not relevant, I’m not needed. I think that scenario, where these AIs come and take over, is very Hollywood, it’s very cinematic. That story is so clear that it’s very hard to have an alternative story. In my book, I’m trying to make an alternative scenario of AI, where this is a good thing for everybody, that we are prospering, that humanity is better and is improving. But I have to say, it’s a difficult picture to paint, because it’s complex and nuanced and also plural. There’s a lot of [possibilities], while in the alternative Hollywood version, there’s only one story: we die. You describe the future of technology as a series of endless upgrades where we are all perpetual newbies. Are we going to need to think of ourselves as in need of constant upgrades? I’m suggesting we actually make this a very clear agenda — say that we are dependent on the technology that we’re making, and that it makes us better. This entails constant learning and relearning and unlearning. That skill will become pretty central to anybody, whatever kind of job or work or play that they’re doing. You are going to be confronted with new things that you have to either decide it’s not for you or become familiar with it and make it integral to what you do. Then, be ready to leave it behind when the next thing comes. When I was [a kid], that was not what we were being taught in school. There was a definite sense of, “Here’s the skills that you need. You master these, you’re set.” That’s no longer true. A lot of job satisfaction, people’s happiness, comes from a sense of expertise. What happens to mastery in a world where we are forever newbies? What does this increasing pace of tech do to the idea of being really great at something? In my study of technology, I was really surprised to discover that in fact, on the planetary global scale, that there’s been no technology that’s gone extinct. Nothing. There are more blacksmiths alive today than ever before in history. There are more people making telescopes by hand than ever before in history. There are more masters at flint-making, arrowhead-making, than ever. I’m talking about absolute numbers, not percentages. The point is that the option for those who want to master something is still there. Machines will have answers. What humans are good at are questions. There just aren’t going to be many of that particular species, whatever it is. If you’re an Excel jockey, there will certainly be a role for you for a long, long time — but there may not be many of you. [In the future] it will be easier to find that person. For whatever reason, in the year 2070, if you need it, you’ll be able to find the three people in the world who can still do Excel. I think most of the mastery, though, will be at the meta-level. If you want an answer, you’ll ask a machine. A lot of mastery will reside in AI and the kinds of systems we make. It’ll be knowing how to find the right person, knowing how to access that expertise. In the past, when there wasn’t a lot of information, top-down, centralized command was by far the best way to get things done. In another part of the book that touches on finding meaning in work, you talk about how new tools and online platforms have led to increased collaboration. How does that play into the way that we’ve traditionally structured human work, how we organize our working lives? The long term trends we see in the world of institutions has been this decentralization of all kinds of things. To lead an army in the Roman era, you had the general giving orders down to the foot soldiers, because the flow of information was so restricted that following orders was the best way to get things done in large groups. Now we have peer-to-peer communication, which makes possible better ways to work together. We’re going to continue this shift towards more and more collaboration, at higher and higher levels. Larger and larger scales. The technologies that we’re inventing enable us to collaborate in real time at the scale of a billion people. I think that changes the opportunities that we have in work. That will enable us to do many, many new kinds of things that we had just not even imagined before. Original interview by Dan Misener, intro and editing by Devon Maloney.